This has been a site I've been meaning to visit for quite some time. It's only about ten minutes from where I live, so there's really not been any excuse for leaving it this long. There are previous entries on the Castle Blog!! 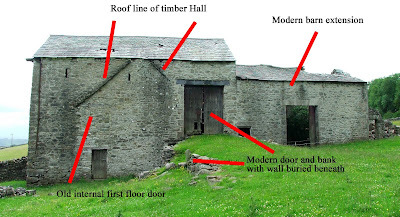 detailing a possibly fortified house....called Helsfell Hall. I think it's safe to assume two things now that this building has been photographed. 1) the building previously named as Helsfell Hall...is not in fact the original hall. 2) this building is most definitely Hesfell Hall. 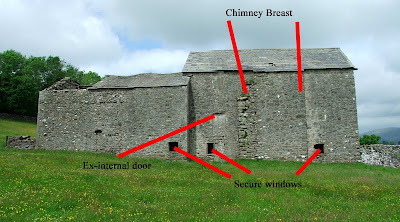 The jury is still out on whether this building was fortified or not, although there are several features that would tend to indicate that if not fortified, it was indeed a very secure dwelling. It was certainly a very important building for the Briggs family, and owing to the fact that it was obviously the hall of the local area, there may have been some small scale of fortification\security necessary to secure this building. This building is in a simply stunning location. 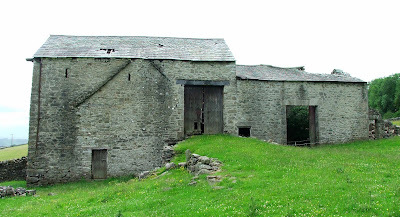 It sits in a field high above Kendal, just off the A5284 to the North West of town. The building can be glimpsed as you drive out toward Windermere....but the blessing here is that there is a public footpath that runs right past it, obviously affording really close examination of the remains. 1st floor three light window....now bricked up. 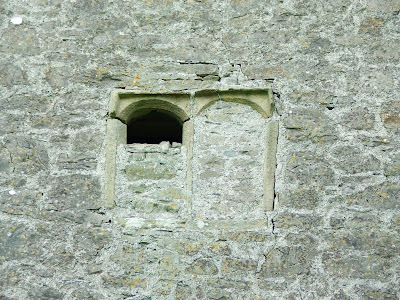 There are also what look like small draw bar slots on the inside of several of the ground floor windows. The following photo shows one of the windows from the inside. The holes for the iron bars can clearly be seen on the right hand jam of the window. 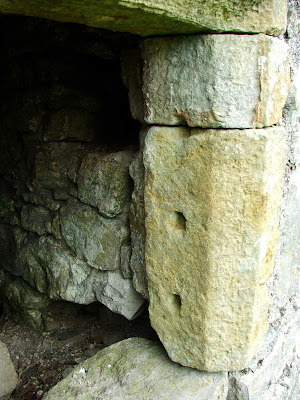 The large draw bar slot, some four inches by four inches in size, and perhaps nine inches deep, can also be seen at the right of the wall. Here's a view of the same window from the outside. The draw bar slot can clearly be seen, and it appears to be lined with slate, possibly to enable smooth retraction of the draw bar. I'm hazarding a guess that there would have been shutters on these ground floor windows, and the draw bar slots would have enabled the occupants to secure these against the inside of the window frames. 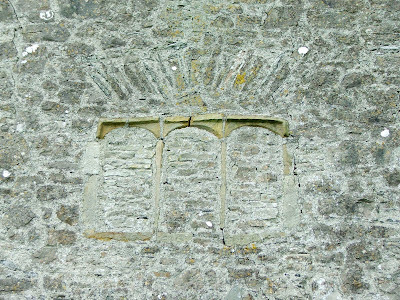 The ground floor window, seen below, appears to be a replacement for a door, the arch of which can still be seen over the top of the window and a later door. 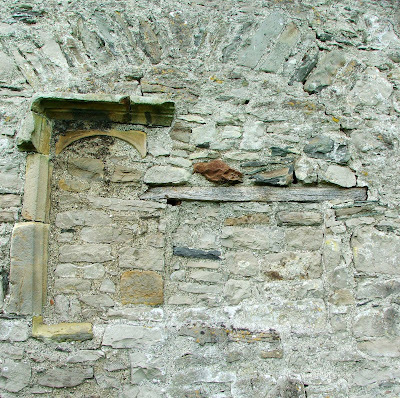 This later door can also still faintly be seen, now bricked up, and with a scrap of wooden lintel still embedded in the stonework. As this, probably the original door way, is now bricked up, we will probably never know if there are further draw bar slots securing this entrance. 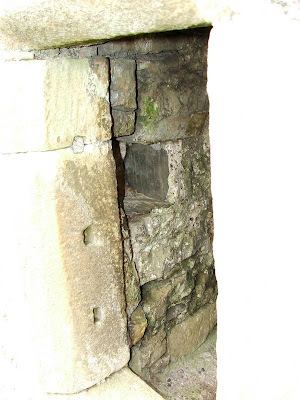 Ground floor details, showing window replacing possible door. This view clearly shows that a building has been demolished at some point. 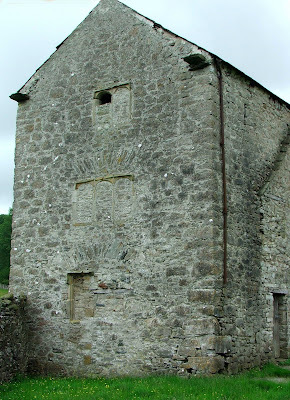 The roof line can clearly be seen above the small doorway which was probably a later addition. This demolished portion is thought to have been a wooden hall. 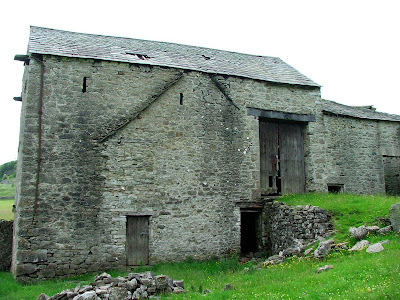 Incidentally, the barn to the right (with the lower roof line) is a later addition to the original hall (a timber building), as is the huge double door at the top of the ramp...which is also probably a later addition. The following photo shows these details better. The huge projection on the South facing wall of the building, turns out to be a huge chimney breast, with some of the pointing missing at the left hand side. The hall most likely dates from the 16th century...with nothing to more accurately date it. The additions, such as the barn to the rear and the bank leading up the double doors are not listed anywhere so it's been impossible for me to date these parts. Cornelia Nicholson, in his fantastic book "The Annals of Kendal" makes mention of this hall. He notes that the hall "lays in the shadows of Hesfell Nab" and that "it was once a place of considerable importance." The hall belonged to the Briggs family, who were cousins of the Philipsons, who held Hollin Hall near Crook, which also dates from the 16th century. The Philipsons were staunchly Royalist, and during the English Civil War, the Briggs family (who were Parliamentarians) frequently clashed. After the war, the Philipsons stripped their cousins, the Briggs, of all their Kendal possessions, including Helsfell Hall. The hall was emptied of all its furnishings and left derelict. It was only listed (Grade II) in 1984, seemingly after years of confusion over which of the three Hesfell Halls was the original and older. Even though it now has this 'protection' (for what it's worth) the hall is still in danger of complete collapse. Indeed, the two later additions at the far end of the hall have both lost their roofs, as well as portions of the supporting walls. The main body of the hall is also starting to lose part of its roof, although this demise seems to be only in its early stages. Cornelia Nicholson also noted that there had been some excavations at the hall, and that an undated dig had revealed a two foot bronze cross. From this discovery, he deduced that there had been a small chapel at the hall. Click on the photos above for details of the hall and its features. I am very interested in the Briggs of Kendal, Westmoreland and Appleby. I am a descendant of some of the Briggs of the area and would be very appreciative of any information regarding them and any other habitations etc. I know of Cowmire Hall once owned by Thomas Briggs. I come from New Zealand. All information is most welcomed!